The crowd is taking their seats. 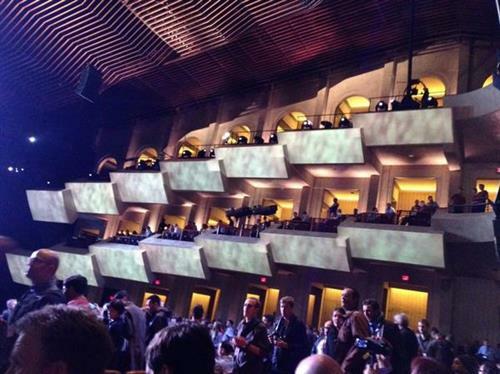 The music is turned up inside the auditorium. Just a few more minutes until show time! Traded my apple products for android, will the iPhone6 make me regret it? C'mon #apple get me a bigger phone, so I don't have to switch! I still have the 4s too & could have gotten a new one at the beginning of the year. Have been waiting not so patiently. Tim Cook is on stage welcoming the crowd. He notes the importance of where he is standing. He's on the stage where Steve Jobs first introduced the Macintosh to the world. "We have some amazing products to share with you," Cook said. Never been this excited about an Apple event! Just sold my 2g. Now on a Samsung S5. If I could have waited, I would have. 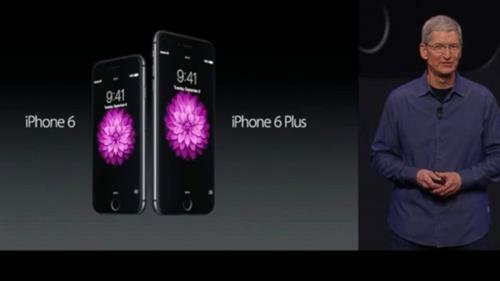 Cook introduces the iPhone 6 and the larger iPhone 6 Plus. Once again, Apple refuses to allow collaboration between their company and PC products by making the video only available to Safari users. This dependency on everything Apple is why I'll never buy Apple again. SVP of marketing Phil Schiller is now on stage. "From the glass fronts, the curves along the side....It is truly the most beautiful phone you have ever seen." Ditto on not wanting a mammoth phone. I'm a guy - I don't carry a purse. A big phone is just uncomfortable. I can barely stand a slim wallet. The iPhone 6 has a 4.7 inch screen, making it .7 inches larger than its predecessor. The iPhone 6 Plus has a 5.5 inch screen. The phones are also thinner than any phone Apple has ever made, Schiller said. Multi-taskers will love this: The iPhone 6 includes a new feature Apple is calling "reachability." Double tap the home button and the screen you're viewing will slide halfway down the page. The iPhone keeps getting faster! There's a new chip in the iPhone 6 and 6 plus -- the Apple A8. It's a 64-bit chip. iPhone 6 & 6 plus bigger, but still designed for one handed use. Sleep button atop iPhone moves to right hand side. Both phones thinner. The iPhone 6 plus can also be used in landscape view -- making it feel sort of like an iPad mini. The stream is being hosted live on Apple's website. In order to view it, you'll need a version of the Safari browser 5.1.10 or later on a Mac with OS X v10.6.8. You can also view it on your iPhone with Safari on iOS 6.0 or later. Anyone know size comparison from iphone 6+ and newest galaxy?????? Stephan Sherman, the chief creative officer of Super Evil Mega Corp is now on stage to demo multi-player gaming on iOS. Wifi within Apple event is very sketchy. Both the Apple open wifi & many of our own mifi units. Too many people/devices packed together. The new game -- Vain Glory -- launches this fall. It also includes a green flower character that has a thing for disco. Still waiting for something to really jump out at me and make me want to buy it. Didn't Apple say this was going to be the best iPhone yet? Come on Apple, shock us with something. Battery issues v important to many. iPhone 6 said to have slightly better battery life. Schiller is back on stage. He says the iPhone 6 and 6 Plus will meet or exceed the iPhoen 5 battery life in every metric. You also now have a reason to take the stairs -- the iPhone 6 will have a barometer for elevation. A messaging app lets users send voice notes, just as they'd send a text. Schiller also talks about a new health app. The iPhone 6 comes in gold, silver and space grey. It starts at $199. The iPhone 6 Plus starts at $299. When can we get them? They'll start shipping on Sept. 19! Schiller says they'll try to be in 115 countries by the end of this year. iPhone 6 starts at $199 w two year contract. One hundred dollars more for bigger iPhone 6 Plus. Ships Sept 19th. People started lining up outside Apple's flagship store last week. More on that here. "We've created an entirely new payment process and we call it Apple Pay." Apple SVP Eddy Cue is now on stage to talk about Apple Pay. He says it will include the "convenience and security" of Touch ID. You can add a new card by taking a photo of it. You then go to your bank and verify your card. It's then added to Passbook. "And now with just a touch, you pay. It's that fast and that easy," Cue said. This Apple commercial is very alluring. Is it getting hot in here? 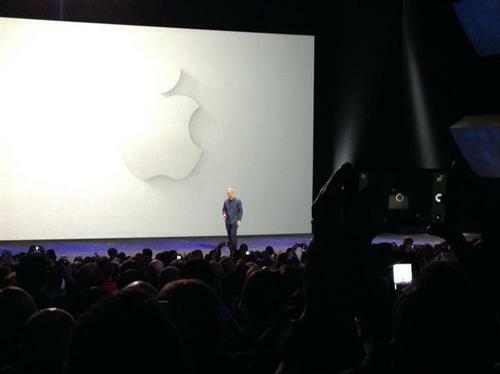 Tim Cook just fist pumped the air, the crowd is going wild. The long rumored watch is here! "Apple watch is the most personal device ever created. We set out to make the best watch in the world," Cook said. This place is getting hot Alyssa.. I'm in the second row !! Tim Cook introducing the Apple Watch. "We've placed extra functionality in a mechanism that has been in the watch for decades." 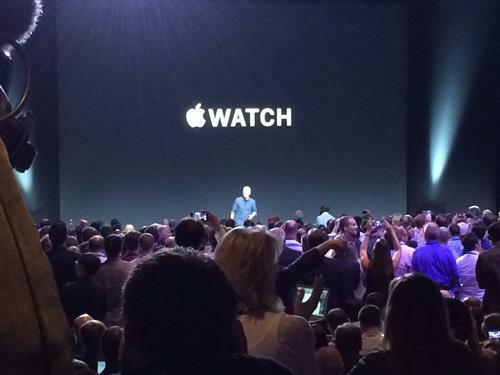 Tim Cook is talking about the crown of the watch. When you turn the digital crown on the Apple Watch, it zooms in and out. You can also scroll through a list. All of this can be done without blocking the screen. The Apple Watch is as much about personal tech as it is about style, Cook says. "We thought not only of the function but of the way it looked."